Folded dimensions: 10.5L x 10.5W x 33H in. Napping and changing convenience is yours in one portable package with the Graco Pack and Play Portable Napper & Changer. Your newborn, under 3 months old, can rest cozy and warm in the removable bassinet. When it's time to change a diaper, the napper easily reverses to a changing table that can support your little one up to 15 lbs. Once finished with changing, the changing table is easily wiped down, and can reverse back to the napper so your little one can continue to get rest. The mesh-enclosed playard is able to accommodate your child into the toddler stage, while they are still under 35 inches tall and cannot climb out. This easily portable system features a signature push-button folding system and is available in your choice of patterns and colors. Changer dimensions: 29L x 19W x 12.5H. Playard dimensions: 29L x 45.5W x 46.5H. Folded dimensions: 10.5L x 10.5W x 33H in.. Fabric, metal, and plastic construction. Choice of available color. 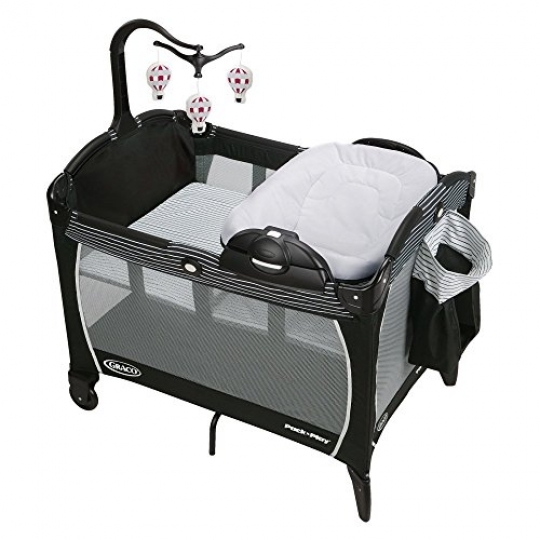 Bassinet for infants up to 15 lbs.. Changing table for babies under 15 lbs.Playard for children under 35 in. unable to climb out. Napper reverses to a changing table. Easily cleaned fabric on changing table. Signature push-button folding system. Convenient carrying bag.